A rollover accident is a type of vehicle crash where the vehicle rolls onto its top or side before coming to a stop. Many of these rollover accidents are single-vehicle incidents in which the vehicle overturned on its own due to excessive speed, poor handling of the vehicle, or negligent design of the vehicle by the manufacturer. Other times a rollover occurs after a collision with another vehicle. 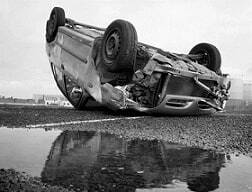 Regardless of how they occur, rollover crashes are frightening for those involved and extremely dangerous as well. Of course, heavy trucks are usually the culprit in rollover cases. Accident statistics have long shown that heavy truck rollovers are an extremely dangerous accident mode for truck drivers and their co-travelers on our highways. A NHTSA study indicating that approximately 1,000 heavy truck occupants are killed in crashes every year and they identified rollovers as one of the key factors that play a contributing role in causing those fatalities. But even though SUVs and larger vehicles are more prone to rollover accidents, they still occur in all types of vehicles. Therefore, the consequences of these crashes must be taken seriously by all motorists. Ejection is the most common source of injuries and fatalities in rollover crashes. Severe injuries are particularly associated with ejection. Ejection is a significant factor in fatal cases. You would think a seat belt would save you. But not always. A study that looked at injuries and deaths in rollover crashes found that 8.9% of those ejected in rollovers with three or more turns were belted. What are Some Typical Examples of Rollover Accidents? A car’s tire blows out or its steering column gets stuck, causing the car to jerk forward and flip onto its side or top, crushing the occupants. A car that is going way too fast and hits a bump in the road, flips over and slides into another vehicle, injuring its occupants. A car is cut off by another vehicle, swerves to avoid the collision, and swerves so suddenly that the car loses control and flips over, injuring the passengers. Which Kind of Victims Recovery Money Damages in a Settlement or Trial? 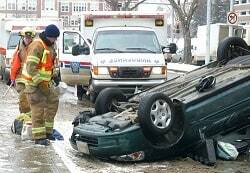 The easiest rollover case to prove at trial is if you are a passenger in a vehicle that rolled over. In these cases, liability is easy to establish. The passenger essentially points her finger at the driver and other possible defendants and essentially says to the jury, "You guys figure out who is at fault. But you know it is not me and I deserve compensation." This is almost invariably a winning argument on liability and the battle is solely about damages and insurance coverage. Another surprisingly good rollover case is when you are cut off by another driver and, while taking evasive action, your vehicle rolls over. The offending vehicle rarely stays around or even knows that he caused a crash. So the claim is a hit-and-run/phantom uninsured motorist case against your own insurance company. These claims are often easy to win under Maryland law because, realistically, it is the driver's word against someone who has not shown up for trial. Credible plaintiffs are generally going to win these phantom vehicle accident crash cases at trial. The insurance companies know this so if there is not a large dispute of the extent of the loss, these cases usually settle before going to trial. The toughest rollover case to proof is the product liability case. The claims usually involve SUVs. The claims are often a design defect that the vehicle is too top-heavy and that, as a result, safety features should have been added to compensate for that weight. Can these cases be won? Absolutely. But no plaintiffs' attorney is going to take these cases unless the injuries are catastrophic or the victim is killed. Why? Because the cost of bringing these claims is extraordinary and you need the possibility of a very large damage award to justify the cost of bringing one of these cases to trial. Danny is thrilled to finally be picking up his new Jeep. He spent his entire bonus check on a new Jeep Liberty which he intends to share with his wife, Dana. Danny thinks it is a safe car and he hopes that it will not cause any problems for him and his wife. As he leaves the dealership, he honks the horn at the car salesman who sold him the car and he heads home, excited to show his wife his new purchase. Danny gets home and decides to take Dana on a ride around the neighborhood. Curious to see how the new car handles, Dana urges Danny to take the car on the Beltway for a quick test drive. Danny agrees and the two enter I-495. Everything is going smoothly for the couple when all of a sudden the car starts violently jerking back and forth. Danny looks over at Dana in sheer terror as he is unable to control the vehicle at all using the steering wheel. It is completely locked in place. The car spins to the right and then overturns, smashing into a concrete divider. The roof of the Jeep caves in on top of Dana’s head, giving her a concussion. Danny has a bruised neck and back, as well as a broken nose and forehead. After some tests are done and an accident reconstructionist is sent to the scene of the accident, it is determined that the cause of the crash was the unexpected and unexplained locking of the steering column. When the steering column locked, the weight of the car went forward and then backward, causing it to flip over. Danny and Dana have a claim against the manufacturer of the steering column in their Jeep Liberty because the faulty steering column caused their car to roll over and left them injured. Maryland: $18,921,775 Verdict. While on a cross-country trip home, Defendant driver, in his mid-30s with a learner’s permit, lost control of the minivan which he was driving, causing it to roll several times. The accident severely injured several people in the minivan and killed a mother and her two children, who were also in the minivan. Prior to the accident, on the same trip, the Defendant had a flat tire. The tire was replaced at a local Walmart. Plaintiffs sued the driver as well as Walmart. Plaintiffs claimed, successfully, that Walmart departed from accepted industry safety standards by negligently failing to inspect the inside of the rim for rust prior to placing on the new tire. Maryland: $241,639 Verdict. Plaintiff, a back seat passenger filed suit against her driver’s uninsured motorist carrier, State Farm, after the vehicle in which she was traveling left the roadway and rolled over. Plaintiff alleged that a phantom motorist allegedly began to move into the lane of travel, causing the driver of her vehicle to lose control and crash. The defendant driver admitted to exceeding the speed limit but contended that the actions of the phantom motorist were the sole proximate cause of the accident. A jury found for the Plaintiff and awarded $46,639 in past medicals, $45,000 in future lost wages, and $150,000 in pain and suffering. This is the classic passenger phantom vehicle case we talked about above. But the verdict is limited to the victim's policy limits. So this verdict is really a $100,000 verdict, a big downside to uninsured motorist claims. $2,895,000 Verdict. Plaintiff, an independent truck driver, sustained multiple injuries including amputation of his arm, after the load that he was carrying shifted to the right, causing the truck to roll over. Plaintiff sued the owner of the tractor-trailer as well as the company that loaded the cargo that he was carrying. Plaintiff claimed $150,000 in medical specials and was awarded $2,895,000. Florida: $2,000,000 Settlement. The plaintiff, 14 years old, was paralyzed in a car wreck when a tire blew out on the Pontiac Phoenix in which he was riding. The car then rolled over, and its roof collapsed, tragically crushing the plaintiff’s spine. The plaintiff’s family sued the manufacturer for damages related to the accident. (Dyess v. Uniroyal Tire Co., 1987 WL 365078). Georgia: $1,115,000 Verdict. A married couple, the plaintiffs, was driving a Ford Explorer when the defendant, who was operating his own vehicle, made a left turn in front of the couple’s oncoming vehicle. The vehicles collided, causing the Ford Explorer to overturn, severely injuring the couple. The plaintiffs alleged that the defendant driver was negligent in failing to yield the right-of-way and they also sued Ford Motor Company, which manufactured the Explorer, on a products liability theory. Virginia: $1,050,000 Verdict. The plaintiff, a 34-year-old man, contended that he was driving a vehicle when he experienced a problem with the steering column which caused him to lose control while traveling at approximately 60 m.p.h. The car rolled over causing the car roof to collapse. The plaintiff suffered severe fractures to his spine, which left him fully paralyzed. He sued the manufacturer of the faulty steering column for all damages related to the accident. Our firm does not take every accident case that comes to us. But if we take your case, you can expect us to fight for you like there is no tomorrow. The team of attorneys at Miller & Zois is very experienced in serious injury and wrongful death vehicle crash cases and are dedicated to achieving the most favorable results possible for their clients. To see if you have a claim, please contact our attorneys today at 800-553-8082 to get a free case evaluation online. How do you value these cases?